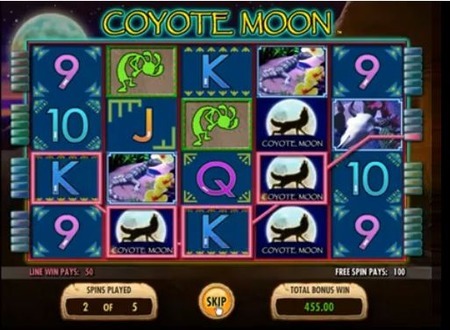 Coyote Moon – IGT slot with up to 40 paylines. International Game Technology, usually called IGT is a casino software developer that is known for its high-quality games. This is the team behind the 5-reel Coyote Moon video slot game, which offers players the chance to activate up to 40 paylines on each spin. The Top Jackpot in the base game of this non-progressive slot is 1000x the total stake, and it has a theoretical RTP of 92.5% to 94.97%. The game can be played for free and for real money, and has a wide betting range that starts at 0.01 and goes to 40.00 per spin. Many players choose to spin for free when they feel like relaxing with a game or practising and polishing their skills, and should appreciate having this option here. When playing for real money slots, they can activate the AutoPlay feature to keep the reels spinning independently on exceptionally busy days. The ancient cultures of the southern regions of North America is the inspiration for the game, and the reels are set against a night sky that has a full moon shining down from the top right-hand corner. The reels themselves look like the canvas used in the tents of these desert-dwelling tribes, and are subtly decorated with ethnic designs. Higher-value icons include an animal’s bleached skull, a hummingbird, a lizard and a deer. The usual playing cards are the lower-value symbols, done in a simple font that suits the rest of the game very well. Authentic land-based slots machine sound effects should involve players further in their gameplay, and animations punctuate each win. The background sound effects of a wolf howling at a moon also enhance the atmosphere. The Wild Symbol here is, appropriately enough, a coyote baying at a full moon. This can substitute for any regular icon to complete winning configurations, creating many winning possibilities for players. Wilds often appear stacked as well, which should help players win even more. The Scatter symbol, a hand-drawn red figure that evokes images of indigenous art, is the only image that the wild can’t replace. When one of these appears anywhere on Reels 2, 3 and 4 at the same time, the Rising Moon Bonus Round begins. In this round players’ wins are given 5 Free Spins, and wins are multiplied by 2. The stacked Wild Symbols mentioned above are also seen more commonly here that in the regular base game, and the Scatter Symbol goes from red to green while all other icons turn a purplish hue. Landing 3 or more green Scatter Symbols during the Bonus Round will reactivate it, which can continue indefinitely. Coyote Moon is well-designed and well-executed, and is simple enough for novices to enjoy as well. The infinite retriggering capacity of the Free Spins Bonus Round can make it a very lucrative video slot, and together with its strong graphics and thought-out theme this should hold the attention of seasoned players as well. It is well worth it for players to try the game and consider adding it to their usual slot rotation.